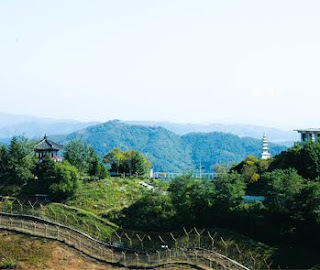 [KTravel] Demilitarized Zone (DMZ) Tours - 짱이뻐! The Korean peninsula is home to a single nation of people with the same language and ethnicity, divided in two. 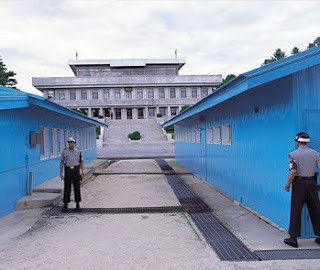 The Demilitarized Zone (DMZ) is a buffer zone, which was established on July 27, 1953 when the Armistice Agreement was signed during the Korean War. The DMZ vividly captures the scars and wounds of the Korean War as well as the wishes and hopes for the future. South and North Koreas drew a truce line across the Korean Peninsula, from the mouth of the Imjingang River in the east, to the town of Goseong in the west. On either side of the truce line is a 2km-wide stretch of land where military activity is forbidden. The zone has been protected from human disturbance for about 6 decades and has become a haven for wildlife. The destinations in this ecological area have been regaining popularity among eco-driven tourists. The following information will introduce the major attractions along the DMZ and related package tours visiting the nearby regions. The Demilitarized Zone (DMZ) extends largely from Gyeonggi-do to Gangwon-do, including seven different cities and smaller counties (called 'gun' in Korean) of Paju, Yeoncheon, Cheorwon, Hwacheon, Yanggu, Inje and Goseong. Thus, to make the most out of your limited time, it is advised to make a plan in advance for which region you would be most interested in visiting. After choosing one area, it will be much easier for you to look around the nearby attractions, centering on and around your choice of DMZ destination. More importantly, you are required to bring legitimate form(s) of identification and/or your passport when going to the DMZ. Photography is another item that should be considered. 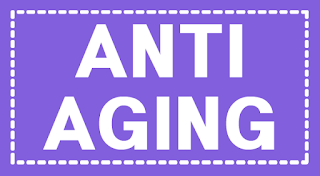 Although it is a highly restricted action in many of these areas, you will still have plenty of photo ops at multiple designated areas. Established in 1972 immediately after the declaration of the joint South-North armistice, Imjingak Pavilion exhibits various relics and monuments related to the Korean War and subsequent South-North confrontations. 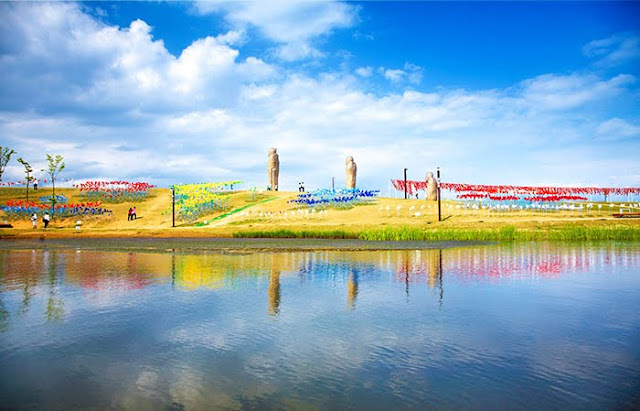 Nuri Peace Park, housed on the same site, is a large park that can accommodate up to 20,000 tourists at a time. 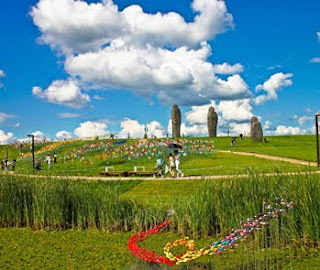 The park has a variety of sculpted artworks and visitors can enjoy performances on the hill. ※ Cafés and restaurants within Imjingak Resort are open until 20:00. Discovered in 1978, the 3rd tunnel was dug by the Northern army to spy on their Southern counterparts. 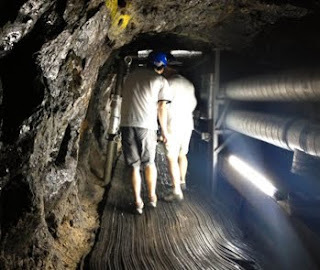 The tunnel is 1.64-kilometers long, 2-meters high and 2-meters wide. It is a prime example of the South-North confrontation. ※ To enter the 3rd Tunnel, visitors are required to apply and register in advance (Application process can be done at Imjingak Tourist Information Center for travelers touring by bus, while travelers on the DMZ Train can do so at Imjingang Station). 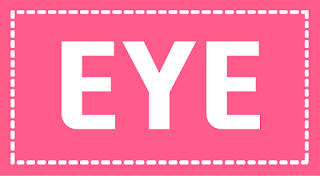 ※ The fees include fare for monorail ride and shuttle bus service. 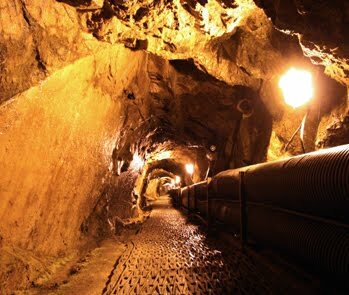 TIP) Tour package must be purchased in advance in order to tour around The 3rd Tunnel. For details on the tour package, kindly inquire at +82-1544-7788 (Korean) or +82-1599-7777 (English) via phone call. 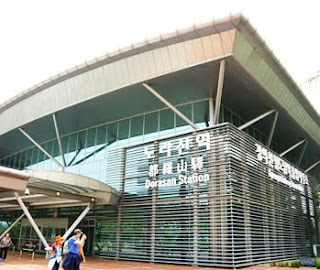 ※ To enter Dorasan Station, visitors are required to apply and register in advance (Application process can be done at Imjingak Tourist Information Center for travelers touring by bus, while travelers on the DMZ Train can do so at Imjingang Station). 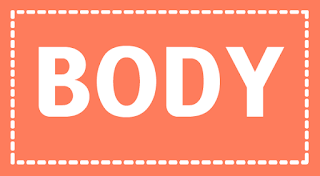 ※ Operating hours are subject to change depending on the season and will vary by weather conditions. Geologically speaking, Panmunjeom is a small chunk of a land located near the Military Demarcation Line (MDL) in Jinseo-myeon, Paju-si, Gyeonggi-do. Formerly called 'Neolmulli', as mere plank of woods ('neolpan' in Korean) were used to erect this establishment long ago, it was thankfully given a new name later. Marking the 'Military Armistice Conference' held in October 1951, the official name was rewritten into the current name of 'Panmunjeom,' and is more widely known as the Joint Security Area (JSA), where blue and white huts are administrated by the United Nations Military and North Korean military, respectively. ※ Private tours are not permitted. Visitors can tour Panmunjeom only by group tour arranged by official authorities and/or travel agencies who have a permit. Tours are not available on Sundays or public holidays in Korea. A place for education on security matters, Unification Hill is situated where the Hangang River joins the Imjingang River. At Odusan Unification Observatory, you can also observe the daily lives of North Koreans. This observatory was built for North Korean defectors and people who were forced to be separated from their families during the war. Here, they can find some small comfort for their souls by looking out toward the hometowns they left behind. With a birds-eye-view of North Korean soil, the observatory building's fence is dotted with notes from visitors wishing for the Koreas' reunification. On exhibit inside of the observatory are daily household goods and military equipment from North Korea, allowing visitors to get an indirect experience of the North. Those visiting The 3rd Tunnel and Dorasan Station must show their identity card at the Imjingak ticket center and get a ticket before beginning the tour. 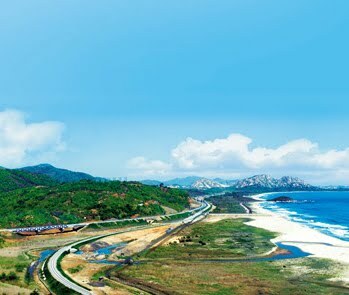 Panmunjeom can only be accessed by group tours arranged by official authorities and/or travel agencies. 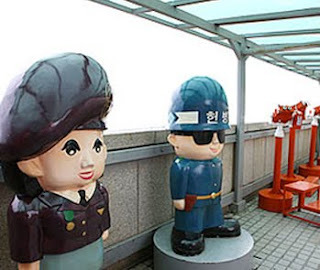 Visitors of certain nationalities may be restricted from sightseeing at the DMZ. Visitors must be at least 10 years old. 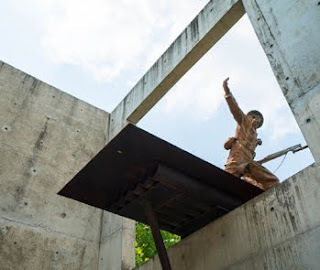 This infiltration tunnel dug by the North Korean army, the second of its kind, was discovered in 1975. With a height and width of 2 meters each, up to 30,000 soldiers could pass through in one hour in addition to tanks, allowing for a large-scale penetration of the nation's defensive line. Inside the cave is a large holding chamber where the troops could gather, with the path splitting into three exits. ※ Cheorwon Tourism Office is closed on Tuesdays, Children's Day (May 5th), day of Marathon Competition (planned in September), New Year's Day (January 1st), and other public holidays in Korea. Please check in advance to confirm your day of travel is available for touring. ※ Visitors are required to arrive at least 20 minutes prior to departure in order to fill out the necessary forms for admission and to process registration for the tour. 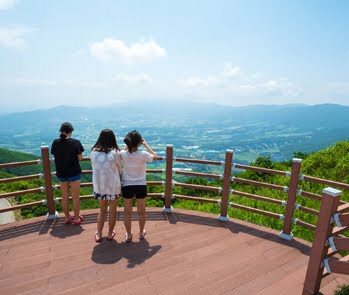 ※ The fees above are security tour package fees that include admission to The 2nd Tunnel, Cheorwon Peace Observatory, and Woljeongni Station. Shuttle bus fare (8,000 won per person) should be paid separately. Cheorwon Peace Observatory offers a view of the surrounding Cheorwon area and the DMZ, as well as a look into North Korea. The floor below the observation deck features a permanent exhibition displaying photographs of The 2nd Tunnel, soldiers' barracks, and checkpoints along the DMZ. The observatory can easily be accessed by all, thanks to the monorail that can carry up to 50 people per trip. ※ Cheorwon Peace Observatory can be accessed only by purchasing a packaged security tour program (The 2nd Tunnel, Cheorwon Peace Observatory, Woljeongni Station), and visitors are required to apply and register in advance for admittance from Cheorwon Tourist Information Center at Iron Triangle Battlefield Memorial. Operating hours (Monorail): Schedule is subject to change without notice depending on the number of visitors expected. Please check in advance to confirm the available days from the operators. After the armistice agreement, Woljeongni Station became the closest station to the Southern Limit Line. The reality of the division cannot be any clearer than here, where a sign reading "The Iron Horse wants to run again" stands before a train rusting at its spot on the tracks. Only the last cars of the train remain, as the front was used by the Northern army during retreat. 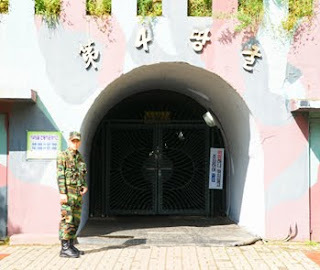 ※ Woljeongni Station can be accessed only by purchasing a packaged security tour program (The 2nd Tunnel, Cheorwon Peace Observatory, Woljeongni Station), and visitors are required to apply and register in advance for admittance from Cheorwon Tourist Information Center at Iron Triangle Battlefield Memorial. ※ The fees above are security tour package fees that include admission to The 2nd Tunnel, Cheorwon Peace Observatory, and Woljeong-ni Station. Shuttle bus fare (8,000 won per person) should be paid separately. Cheorwon Korean Workers' Party Headquarters was built in the Russian style, as North Korea had strong ties with the Soviet Union. 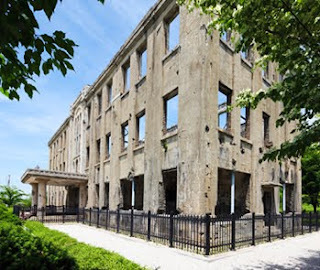 The stairs leading to the front door are marked by the tracks of a South Korean tank and the walls of the building are still scarred with pockmarks from the many bullets and shells. In contrast to this image of the war, the back garden bursts with Rose of Sharon trees, the national flower. ※ Admission to Cheorwon Korean Workers' Party Headquarters is available by purchasing a DMZ Train packaged tour program. 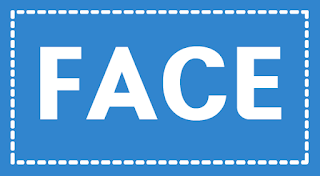 Tourists who are not with the program may also be admitted by buying an admission ticket on-site. ※ Closed Mondays, Children's Day (May 5th), New Year's Day (January 1st), other public holidays in Korea, and scheduled maintenance days. ※ The fees above include fare for the shuttle bus service, meals, and tourist facilities included on the itinerary. The DMZ train ticket should be purchased separately. The name of Seungilgyo Bridge was known to be a portmanteau of the two leaders of Korea at the time of the war, Syngman Rhee and Kim Il-sung, but it was actually named after a soldier who died in the war. The bridge is unique in that it was jointly built by both nations. The bridge was started during the war, in what was North Korean land. However, after the Armistice Agreement, the land was given to South Korea, who then finished building the bridge. 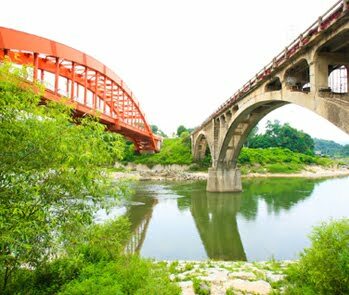 ※ To visit Seungilgyo Bridge, visitors are required to apply and register in advance at Cheorwon Tourist Information Center at Iron Triangle Battlefield Memorial. ※ The 4th Tunnel can be accessed only by purchasing a packaged tour (Eulji Observatory, The 4th Tunnel, War Memorial Museum in Yanggu) in advance at Yanggu Unification Hall. 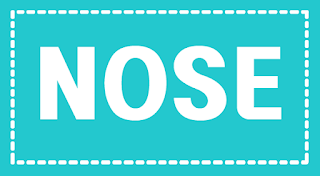 ※ Foreigners of certain nationalities may be denied admittance, therefore it is advised to correctly identify and answer the physical-specific questionnaire (e.g., Name / date of birth / skin color, pupil color, hair color, etc.) when filling registration to avoid any inconvenience. ※ Package admission fees include admission to Eulji Observatory, The 4th Tunnel, and The War Memorial Museum in Yanggu. Yanggu is home to some of the fiercest battlegrounds from the Korea War. To commemorate the battle and the lives lost, the War Memorial Museum of Yanggu was built. The exhibition hall displays over 500 weapons and other items from the war. The museum also features a corner showcasing testimonies from survivors, giving a glimpse into how life was during the war. 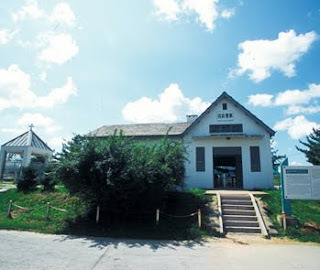 ※ War Memorial Museum in Yanggu can be accessed only by purchasing a packaged tour (Eulji Observatory, The 4th Tunnel, War Memorial Museum in Yanggu), and visitors are required to apply and register in advance for admittance at Yanggu Unification Hall. Eulji Observatory is located approximately 1km south of the Military Demarcation Line (MDL). The view from the observation deck includes five peaks from Geumgangsan Mountain in North Korea, known to be one of the most beautiful mountains on the Korean peninsula. The observatory is also considered one of the best places to view Punch Bowl basin shrouded in mist. ※ Eulji Observatory can be accessed only by purchasing a packaged tour (Eulji Observatory, The 4th Tunnel, War Memorial Museum in Yanggu) and visitors are required to apply and register in advance for admittance at Yanggu Unification Hall. Pyeonghwa Dam, or Peace Dam in English, is located in Yanggu-gun. This is one of the most frequented spot included in almost all security tour packages, having both the Punch Bowl and Goseong Unification Observatory nearby. The dam went through several periods of construction and was finally able to be completed with the help of public donations. 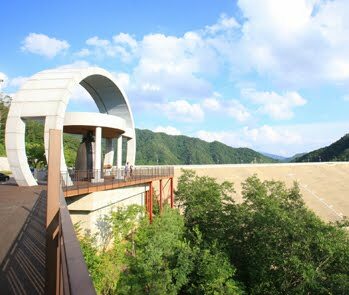 After resting and enjoying the view from the dam, try visiting nearby landmarks and other historic sites, such as Bimok Park, Bisugumi Valley and more. 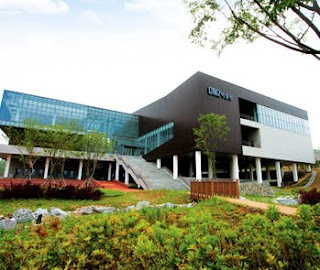 DMZ Museum is comprised of four major themed-exhibition halls, in addition to auxiliary buildings including a special exhibition center, theater, and other convenient facilities. The museum teaches visitors everything there is to know about the DMZ, from its historical background to reports on the area's future ecological importance and cultural value. People with a high interest in history can also visit the theater and learn more about the Korean War and its aftermath through 3-D documentary films. ※ DMZ Museum is accessible after registering for admittance at Unification and Security Park and completing security training. The Goseong Unification Observatory is the northernmost viewing post present in Korea. Over 1.5 million Koreans who were separated from their families come here to see their hometowns in the hopes of reunification. On clear days, Geumgangsan Mountain and other natural beauties come into sight. If lucky, you may also catch a glimpse of North Korean citizens going about their daily lives. On the observatory deck, replicas of weapons and other war supplies used during the Korean War can be found, as well as everyday items used by North Korean people. ※ Unification Observatory is accessible after registering for admittance at Unification and Security Park and completing security training. Hwajinpo Lake is a lagoon, a rarely seen ecological feature in Korea. Beside the beautiful view seen from the lake of a verdant green forest densely packed with pine trees is the Hwajinpo History & Security Museum. 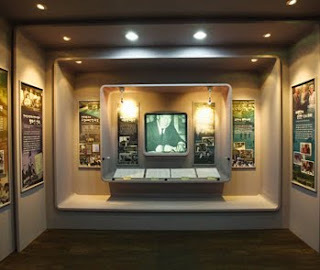 Here, people can learn more about Korea's history and security education, covering over 50 years of modern history. Once the private use of former presidents, the site has now been turned into its current form of a public museum. The museum displays a variety of artifacts that are important in exhibiting the political conflict and heartbreaking records on how the two Koreas dealt with the separation. - Visitors can enter the 2nd Tunnel, Cheorwon Peace Observatory, and Woljeongni Station by participating in a packaged tour program (available at Cheorwon Tourist Information Center located in Iron Triangle Battlefield Memorial). - Visitors are required to register at Unification and Security Park to enter the DMZ Museum and Goseong Unification Observatory. 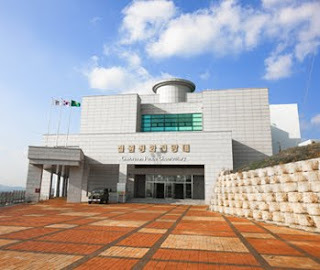 - Visitors can enter the 4th Tunnel, Yanggu War Memorial Museum, and Eulji Observatory by participating in a packaged tour program (available at Yanggu Unification Hall).